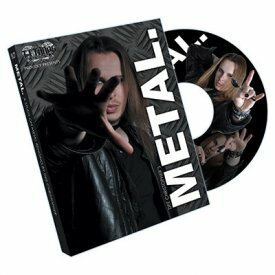 This is the last DVD of the series! We are very proud of this series. 20 DVDs, 200 tricks and routines with ESP cards. A unique, complete collection. This is the twentieth in the series of DVDs dedicated to effects using ESP cards. A tribute to Howard Adams, Warner Miller and Nick Trist that are certainly the most prolific creators with revular ESP cards. ESP CHOICE (Aldo Colombini): An ESP symbol selected among five, is the only one having a different colored back! STRANGERS (Howard Adams): Three persons, after each has selected a card, find duplicates of their designs using a number they freely decided upon! PREDICNIC (Howard Adams): A prediction involving coins and ESP cards! ONE SEE (Howard Adams): Person selects a design. Seconds later this design proves to be a prediction of a design he will later choose! NO BIG DEAL (Werner Miller): Cards are shuffled face down and face up and only one remains face up: The same symbol as the spectator's! WINDMILL (Werner Miller): A great combination ESP cards and regular playing cards that help finding an ESP symbol! EQUALIZER SANDWICH (Werner Miller): Two indifferent cards find a duplicate of the spectator's card! ESP PARADOX PAPERS (Nick Trost): After a card has been selected, you lay down 16 cards, some face up and some face down. The spectator assembles the cards into one packet. At the end, only four cards are reversed, say the Circles. The selection is the fifth Circle! COINCIDENCE BY DESIGN III (Nick Trost): Five matching symbols turn up supposedly by chance under the directions of the spectators! TELETHESIA (Nick Trost): Twenty ESP cards are shuffled and five symbols are turned face down by a spectator. The thing is repeated. At the end, two packets are placed side by side. Cards are turned up from each pile and the pairs match throughout! Simply enter your details below and we will send you an e-mail when “ESP Card Magic Volume 20 by Wild-Colombini Magic - DVD” is available to ship!